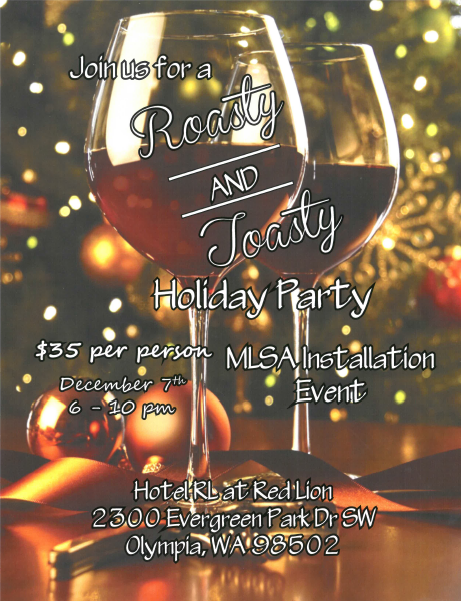 The 2017 MLSA "Roasty and Toasty" Holiday party and Installation Event on December 7th starting at 6:00 pm at the Hotel Red Lion. The event will include installation of the 2018 Board of Directors, dinner and awards. There will be great food, a professional DJ and a local comedy genius Ruben Kerson! We are even having a Joke Contest for all you wisecrackers! Tickets are $35 per person and space is limited. For ticket purchases contact Stacie Belman, Christina Janis, Sue Wise, Melanie Boyajian or Skip Thompson.